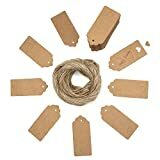 The Package including 100 pieces kraft paper hang tags and 100 feet long jute twines. 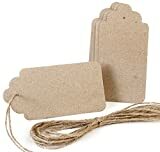 The hang tags are made of quality kraft paper card, which weight is about 12 ounces. 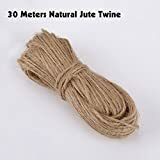 The jute twines are natural color, about 1.5mm thickness, 2 x 50ft hanks. 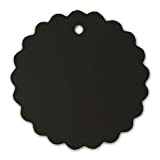 These hang tags are great for gift tags, wedding, baby shower, party, scrapbook, and your special craft programs. The item will send via UK-Royal Mail 2nd class ship, you can get it 2-5 days after get your payment ! Convenient and practical, and beautiful. 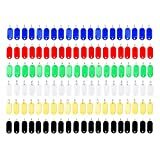 Please allow a little color difference due to the effect of lights. 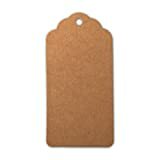 Vintage price tags are perfect for clothing labels, labels, gift tags, student word cards, favorites labels, decorative elements for cupcakes, wish trees, thank-you notes, love notes, scrapbooking ect. Size: 4 x 7 cm. 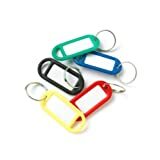 Material: The favor tags are made of 300 (GSM) High Quality Card Paper. The item will send via UK-Royal Mail 1st class ship, you can get it 2-3 days after get your payment ! 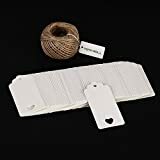 Hollow heart pattern and versatile: each kraft gift tag has a hollow heart pattern; Suitable for wedding, birthday party, holiday, Valentine's Day, Thanksgiving Day, anniversary, etc. HIGH QUALITY WITH INCIDAREABLE PRICE: Give you less unit price for best superior copperplate paper. 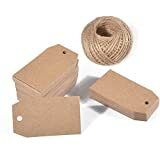 These tags made of 350g high quality Kraft Paper would be your best choice! 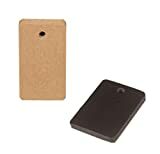 SMOOTH WRITING EXPERIENCE: Made of best superior copperplate paper offer you the smoothest writing experience, the Kraft paper can be used with markers/stamps or ink; these kraft tags absorb the ink well , definitely will not make your ink smeary. 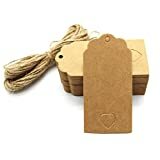 EXPERIENCE MULTI-FUNCTION: The vintage tags are not only perfect for Clothing tags|Price tags| gift tags, but also can be the best decorations for cupcake|Wish trees|Thank you notes|Invitations|Love notes ect. Or if you are a DIY Crafting Lover, it also can be a classic ornament for your art work. 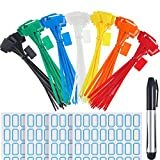 Are you a ¡°paly when¡± game lover? 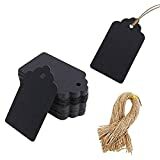 Try use these tags to increase your game's lovable element! 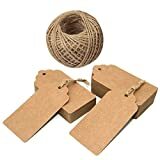 ALL NATURAL SET: The whole set are all naturel, healthy and environmentally friendly, you can be free to use.The tags come with 100pcs jute strings (200mm). We choose to use Natural to make those strings. We try to keep the most primitive form of the products which is the charming point of Kraft as well. 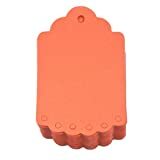 Applicable to: Can be used as tags, confetti, scrapbooking embellishment. 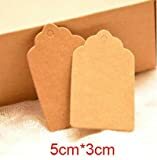 The kraft paper hang tag is a great item as wedding favour tags, scrapbooking embellishment, cupcake toppers,gift tags or other place name cards. 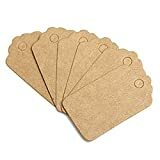 These blank gift tags are made of good quality kraft card paper, with smooth surface; The kraft tags absorb the ink well.The tags are sturdy, made from high quality brown paper card and come with hairy twine to tie them onto whatever you are labeling.Suitable for doing DIY cards,bookmarks, clothing tag candy box accessories etc. Material:Kraft Paper. Color:White,as picture as show. Size:6*6cm. 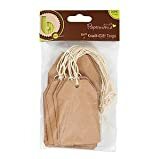 These gift tags are sturdy, made from kraft paper card,You can tie them to any of your favorite labels. 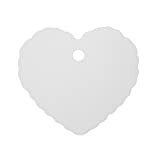 Love heart shaped, mini and easy to use.Great as wedding favour tags, gift tags or other place name cards. 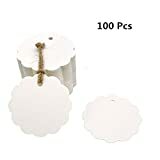 Can be used as message cards, tips, greeting cards, postcards, notes, price sign and Other places. 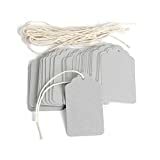 These tags are perfect for clothing tags, price tags, gift tags, student words cards, bookmarks tags,cupcake toppers, wish trees, thank you notes, journaling, lovely notes, scrapbooking, etc. 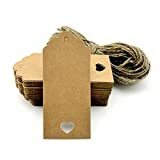 20 x GIFT TAGS made from 300GSM KRAFT PAPER and ready to use. 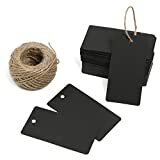 PREMIUM QUALITY PAPER - A lot of gift tags are made from low grade quality paper, our tags are very sturdy and absorb any ink very well. 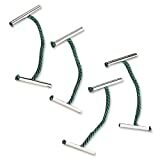 PRE-CUT STRING - Cutting the string down to size can be a pain, Don't worry.... we cut it down to size for you. 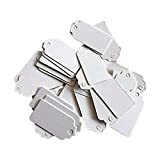 PRE-PUNCHED HOLES - Having to manually punch the hole one by one would take a long time, we got you covered on that too. 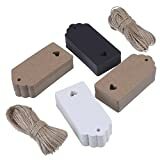 BRING OUT YOUR OWN CREATIVITY - Use these tags to make your own DIY project. 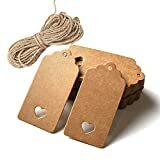 Whether you are an artist, crafter or just looking for something to spice up your gifts... Our tags will fit your needs. 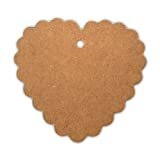 Suitable for wedding favors, gift tags, name cards, price tags, bookmarks tags, embellishment, etc. 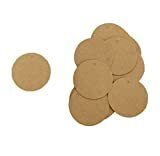 ❤Material:High Quality Kraft Card Paper.